Of course, My Sweet Hubby (MSH) and I are beyond excited that TLC and her Crew will be moving 45 minutes-ish/30 miles-ish closer to us! It’s been about nine years since we’ll be this close—in distance. I’ve put so many miles on my past two cars I cannot even imagine what it’ll be like not to have oil changes/checkups every two months! Woo Hoo and Yippee!!! I’ll be rich! Ha. I loved it! Naturally, I would never have recalled that email I sent to her. I’ve also never talked about my own mother on our blog. Her mother, my Nana? Yes. Y’all know I adored her. I’m sure you’re not surprised I have many reasons why I’ve been silent about this "mother" part of my life. Not happy ones. Not easy ones to understand. But she (my mother) can (totally unintentionally) be very funny. My Nana was often like that. My mother would say it was the “English” in Nana. Also, I might have seemed shallow/negative/rude when telling TLC to be mysterious and challenging to men she was dating. And then to “find a Bob.” Finding a Bob was a joke. The part about being a challenge? Yep. I was serious. I don't like or promote "games." Truly. But if we have to play them, let's at least figure out some of the secrets to winning. Occasionally. It took me fifty years to even begin to believe I had men figured out. (I still haven’t—I am getting close.) I am certain they like challenges. Most of them, anyway. They cannot and will not ever understand us women, right? Most don’t even want to try. But I’ve learned this: We must, as women, wives, girlfriends, mothers, daughters, females, catch them off guard. If they expect you to yell? You need to be quiet. If they expect you to be quiet, well, go ahead and yell. With some restraint. It’s ridiculous. Sadly, in my humble opinion, I'm speaking the truth. Now to my FABULOUS recommendation! I’ve had bad/yucky/cracky/awful nails for many, many years. I got “sculptured” nails from Kit when TLC was tiny. Two. My previously healthy nails turned hideous after delivering her to this Earth. The problem with the beauty shop nails? My life revolved around them and I couldn’t handle the stress. My next professional manicure happened at age 37. With my FIRST professional pedicure. Could have cared less about the mani. FELL IN LOVE with the pedi. You’re not surprised: I don’t get many manis. I'm jealous of pretty nails on my friends' fingers. TLC’s are quite lovely. A LOT of the time. I simply don’t have that commitment built into my DNA. However, I don’t like UGLY nails. 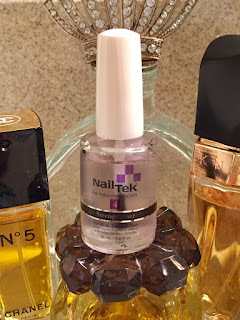 About ten years ago, the young lady that gave TLC and me pedis told us about Nail Tek. I tried it—and KNEW it was good. Yet, I couldn’t even stay committed to this. Fast forward to two months ago when I was in my favourite Walgreens and had some time to browse. I’d bought a Sally Hansen product a couple of years ago and thought it was fairly effective. Now I see Nail Tek and decide to try it again. Hope each of you has a great Friday Eve, Friday and weekend! Paint your nails! Browse a drug store! Look at some treasures you’ve kept! Be safe.